Hi Friends! Happy Monday! I hope you had a nice weekend. They go by too fast though, don't they? 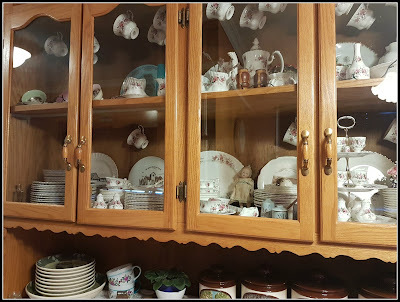 I spent all day Saturday rearranging furniture (which always leads to floor washing and other house-cleaning tasks) because my Sweetheart bought me a gorgeous china cabinet. This cabinet is huge so it took some thinking (and measuring) about the best spot to put it. Then I began putting my Lavender Rose china set, as well as other special pieces, into the cabinet. I love my china. My parents had me pick my pattern when I was about 9 years old and I've never regretted it - Lavender Rose (Royal Albert) is so dainty and pretty. Throughout the years when I was growing up, my parents would give me pieces for birthdays, Christmas, etc and gradually built up my collection. I think china may have gone out of fashion a bit, but I love to USE my china - always have. It was so nice to finally unpack all my china and special pieces (hard to believe it's been three years since I boxed it all up). It was also a sweet walk down memory lane, as many items have special people and memories attached to them too. 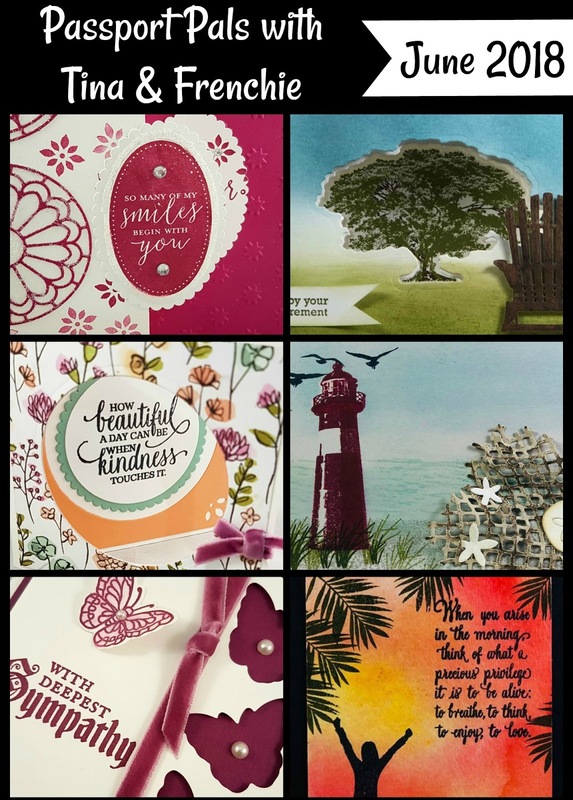 Place the designer paper at the bottom of the Whisper White layer for placement. 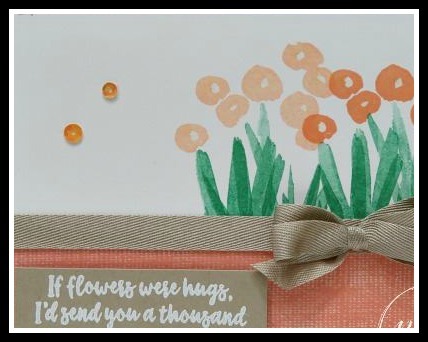 Using a pencil, draw a light line so you will have an indication where to stamp the flowers. 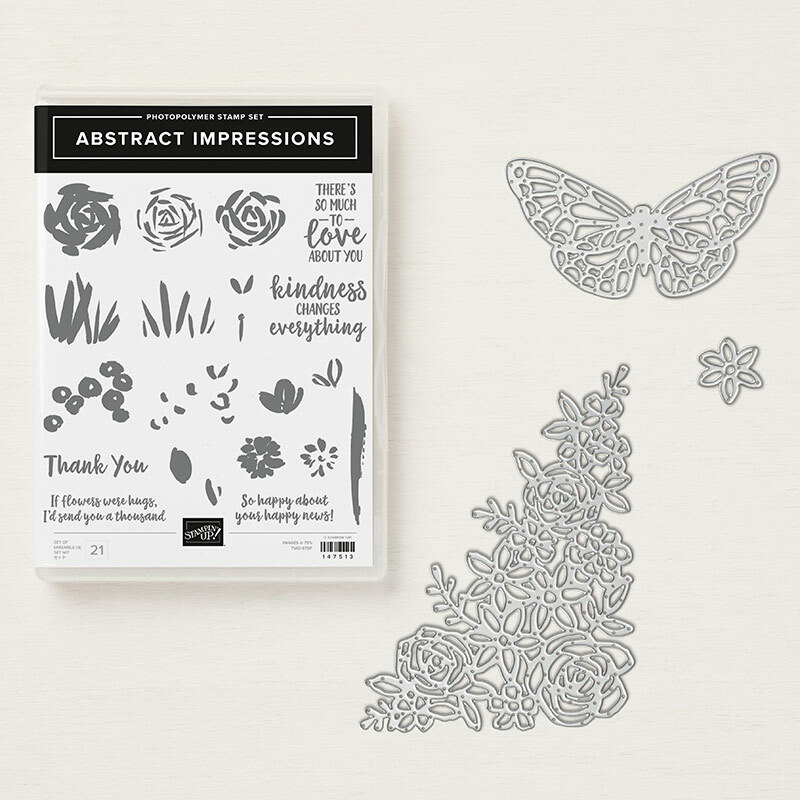 Stamp the larger, solid stems image using the Call Me Clover ink. Stamp off one layer of ink to reduce the shade. Stamp the stems on the far-right side of the Whisper White layer at the pencil line. Repeat for a second row as shown. 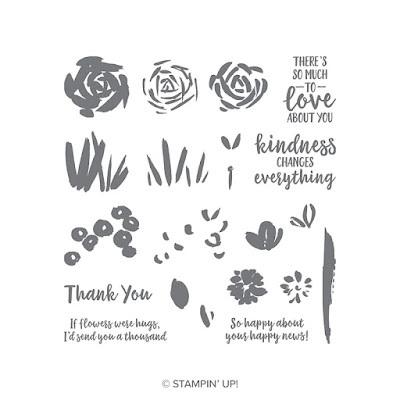 Stamp the smaller, solid stems using the Call Me Clover ink. Stamp directly over the first set of stems. Don’t worry about aligning them. 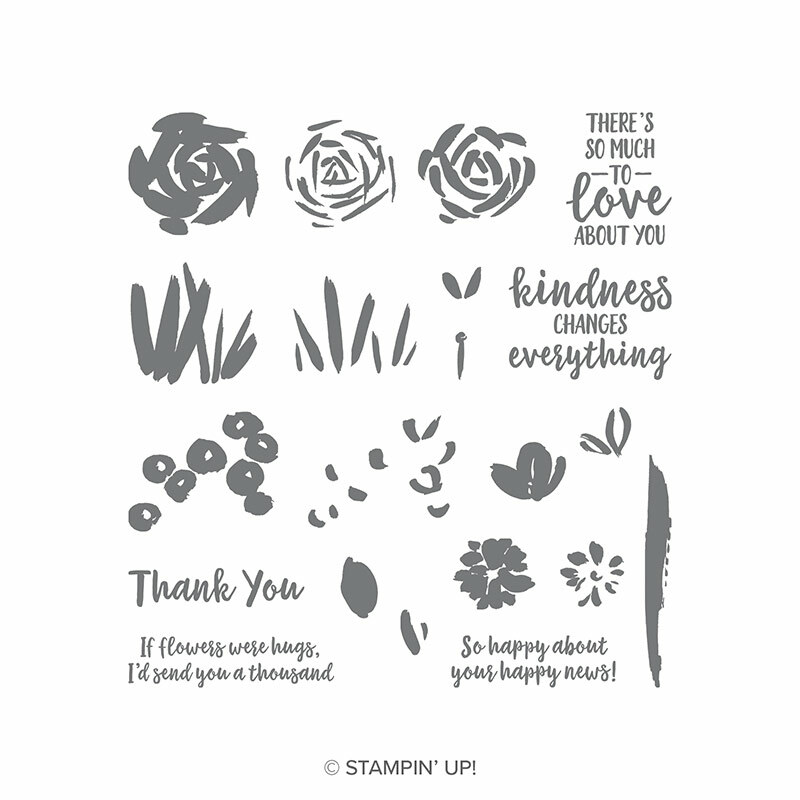 Stamp the Poppy flower image using Grapefruit Grove ink directly above the first set of stems on the far-right. Repeat for the second set of stems, stamping off one layer of ink. Don’t worry about aligning the flowers to the stems. Adhere the designer paper to the bottom of the Whisper White layer. Adhere the 6” piece of ribbon between the designer paper and the stems using Glue Dots. Create a double bow using the 16” piece of ribbon. Adhere to the right side as shown using Glue Dots. Rub the Embossing Buddy on the ¾” x 2 ¾” piece of Crumb Cake cardstock. Stamp the greeting using Whisper White Craft ink. 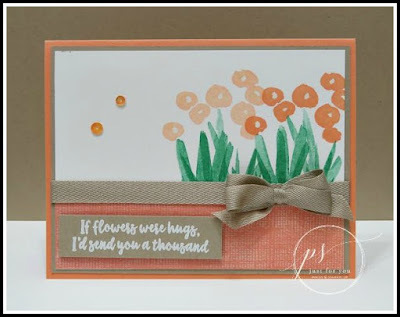 Immediately sprinkle with the White Stampin’ Emboss Powder. Heat set. Adhere the greeting to the lower left side of the card base using Dimensionals. Adhere two Irridescent Sequins using Fine-Tip Glue. Let dry. Minimum orders of $60 or more (prior to tax and shipping) will also receive the Bonus Passport Pals tutorials, created by Frenchie (France Martin) and myself - that means you'll receive 18 free project sheets! 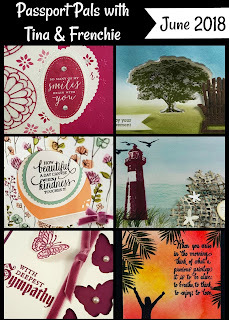 This month's Passport Pals tutorials are masculine themed cards! If you live in the USA, click here to visit Frenchie on her to blog and here to shop through her online store. Pretty card. You are so good with your bows too. I have difficulty with them. Nice china cabinet. I have my dad's Royal Dalton china but no cabinet as I'm in an apt. I do bring it out if I have girlfriends over for lunch or supper. It feels so nice to use nice china, doesn't it? !